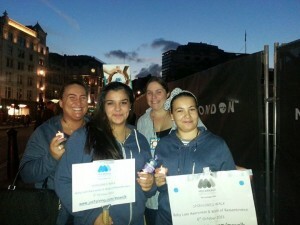 I decided to arrange the London Walk of Remembrance because I’ve lost 4 babies to miscarriage. I wanted a way to commemorate their brief but significant lives as well as raising some funds for the Miscarriage Association. We decided on a twilight walk, beginning just before the sun set at Trafalgar Square. There were only a few of us, so it had a lovely intimate feel. Our walk took us along the Thames on the Northern side were it was quiet and calm and we remembered the little lives we’d carried for such short times. We crossed at Millennium Bridge to the lively South Bank where the atmosphere was very upbeat. This prompted us to share what we’re thankful for in our lives. As it was a cold night we had hot chocolate before getting back on the tube. During the walk several women approached us and took details of the Miscarriage Association and we raised not only funds but awareness, so all in all the walk was a success.